Over the past months of my placement with the Mohawk Council of Akwesasne Justice Department, there have been some exciting legislative developments in the community. In June a referendum was held on the Akwesasne Oién:kwa Kaianerénhsera (Akwesasne Tobacco Law) regulating the manufacturing and distribution of tobacco on the territory, and this month the community’s Tekaia’torehthà:ke Kaianerenhsera (Akwesasne Court Law) came into force. The cover page of the Akwesasne Court Law. This is a picture of the crumpled paper copy I carried around with me all summer. A full (less crumpled) version is available on the Akwesasne Law Registry (link at the bottom of the blog post). I have decided to focus this blog post to the latter. The Akwesasne Court Law coming into force is an event worthy of celebration not only for the Mohawks of Akwesasne, but also for First Nations across Canada, because it marks the “birthday” of the first ever independent court established by a First Nation. The Mohawks of Akwesasne have been administering their own justice since well before Jacques Cartier first arrived on Mohawk territory in 1535. As members of the Haudenosaunee Confederacy, The Mohawks were united with the Cayuga, Onondaga, Oneida, Seneca, and later the Tuscarora, under the Kaianerekowa (Great Law of Peace); bringing together the previously warring nations. This law enforced the matrilineal clan system across the Confederacy, based on hereditary leadership. With Canadian Confederation, however, came a number of obstacles preventing the community from being able to effectively exercise their traditional Haudenosaunee government. Section 91(24) of the Constitution Act 1867 assigning “Indians and Lands Reserved for Indians” to federal jurisdiction was used to justify a number of assimilative policies which had, and continue to have, severe repercussions for all First Nation communities, including Akwesasne. In Akwesasne, elections were imposed by the Canadian government in 1899 in an attempt to disempower the traditional Mohawk council of chiefs. This imposition, along with the larger assimilative scheme of the Canadian government, ultimately prevented the community from being able to administer their own traditional justice effectively. Perhaps the greatest obstacle Akwesasne faced in this regard was the drawing of a Canadian-American international border squarely through their territory, and the further quartering of their land into the Canadian provinces of Ontario and Quebec. These borders alone have made it virtually impossible for the community to administer one cohesive justice system, since the Mohawk Territory of Akwesasne, and the larger Haudenesaunee Confederacy, now have to contend with multiple imposed colonial jurisdictions. Despite efforts to dispossess the Mohawks of their traditional institutions, the community has never stopped asserting their right to govern themselves and their traditional territory. The Akwesasne Mohawk Court is an example of this. The court itself, established by the Mohawk Council of Akwesasne (MCA), has existed since the 1970s, but its character has evolved substantially since then. For the first twenty or so years of existence, the court operated under the Indian Act, with Minster of Indian Affairs approved justices of the peace adjudicating by-laws passed under section 81 of the Act. The court was therefore under tight control of the Canadian government. Over the past few decades, a number of interrelated factors made it easier for the community to effectively assert their right to make their own decisions about their judicial institutions. Firstly, the Constitution Act 1982 entrenched this right by “recognizing and affirming existing Aboriginal […] rights” under section 35(1) of the Act. This effectively gave the assertion of this right a Constitutional backbone. Furthermore, towards the end of the 1980s the Minister of Indian affairs began rejecting a greater number of by-laws proposed by the MCA. The band council ratified some of the rejected by-laws anyway, marking the beginning of the community passing legislation themselves under their inherent right, as opposed to under the authority of the Indian Act. An important factor leading to the establishment of an independent court at Akwesasne was a report produced by Bruno Steinke in 1995 (the Steinke Report). The findings of the report indicated that overwhelmingly Mohawks of Akwesasne were in favor of establishing their own independent Mohawk court on their territory. The survey indicated that the community wanted a court to be structured like a Canadian court, with the incorporation of traditional restorative Haudenosaunee principles, presided over by justices from their own community. A reading of the Akwesasne Court Law clearly demonstrates that the Akwesasne Mohawk Court as it stands today has been modelled directly from the Steinke Report recommendations. The law represents a significant shift from the Court’s earlier days of operation in one very important way: its source of authority is the community itself, and their inherent right to self-govern, as opposed to the Canadian government via the Indian Act. 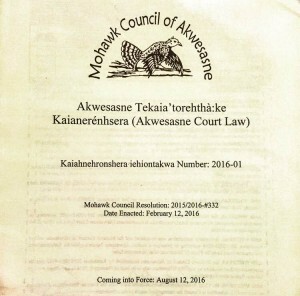 The coming into force of the Akwesasne Court Law on August 12 laid a framework enabling the Mohawk Council of Akwesasne to adjudicate their community laws. The law sets out the principles, powers and authorities of the Akwesasne Mohawk Court and governs the conduct of the institution’s justices. It also outlines the Court’s jurisdiction, which spans across a broad range of civil matters, including contract disputes, matrimonial property, and the regulation of untaxed tobacco products on the territory. Aside from the symbolic significance of Akwesasne Court Law for Akwesasronon in terms of what it means for the MCA’s assertion of self-government, the law also places the community at the forefront of indigenous self determination efforts in Canada by laying the foundation for the first independent court established by a First Nation. The mix of legal traditions informing the Court Law is also unique: In accordance with the expressed will of the community, the court is set up to be adversarial; operating in accordance with fundamental principles of Canadian justice. What sets it apart from Canadian courts is the incorporation of traditional restorative Mohawk principles into the institution’s judicial framework. The distinct blend of traditions in the Akwesasne Court Law is particularly present in its sections pertaining to remedies. While some are in line with what one might expect a provincial or Federal judge to order, others are unique to the Mohawk Court. Illustrating the former, section 9.3 states the payment of fines or ordering injunctions are both within the scope of remedies a Mohawk judge might order. On the other hand, the requirement under section 3.4 that a judge consider “the talents of the [offending party]”; and use these for the benefit of the community to remedy their infraction; is a consideration one would certainly not encounter in a Canadian Court. The inclusion of Mohawk principles in the Akwesasne Court Law is important for two reasons: Firstly, it is an affirmation of the community’s cultural identity. Secondly, by employing restorative mechanisms focussed on healing for offenders, the law illustrates an approach to justice which promotes the long term wellbeing of the community. On a practical level, the Akwesasne Court Law guarantees members of the First Nation that their cases will be heard by a Mohawk Judge from their own community, and that they can choose to have court proceedings conducted in either English or Mohawk. The law will also lessen congestion in nearby provincial courts, as it gives Mohawks of Akwesasne the possibility of referring to their own court to adjudicate community matters. At the Akwesasne Justice Department I have been fortunate to work with some of the amazing trail-blazing minds behind the Akwesasne Court Law. I feel being an intern here during the first “birthday” of the Akwesasne Mohawk Court essentially gives me a backstage pass to history-in-the-making. Expressing how much this has meant to me is difficult, but suffice to say I consider myself to be one incredibly lucky law student (and human being). Akwesasne Oién:kwa Kaianerénhsera (Akwesasne Tobacco Law), MCR 2016-2017-#075, Purpose para 2. Frey, S.L., The Mohawks : An Inquiry Into their Origin, Migrations and Influence Upon the White Settlers, (Utica: Oneida Historical Society, 1898) at p 6. Joyce Tekahnawiiaks King, “The Value of Water and the Meaning of Water for the Native Americans Known as the Haudenesaunee” (2007) 16:3 Cornell Journal of Law and Public Policy 1. Constitution Act, 1867 (UK), 30 & 31 Vict, c 3, s 91(24) , reprinted in RSC 1985, Appendix II, No. 5. Rarihokwats, How democracy came to St. Regis & the thunderwater movement, (Rooseveltown, NY: Akwesasne Notes, 1974) at p 8. Indian Act, RSC 1985 c I-5. Anna Gilmer in conjunction with the Akwesasne Justice Department, History of the Akwesasne Mohawk Court (2015) at p 6 [unpublished, archived at the Mohawk Council of Akwesasne Justice Department]. Ibid note 6 at pp 8-9..
 Bruno Steinke, “Justice Needs in a Mohawk Community: Akwesasne” August 1995 at pp 65-70. 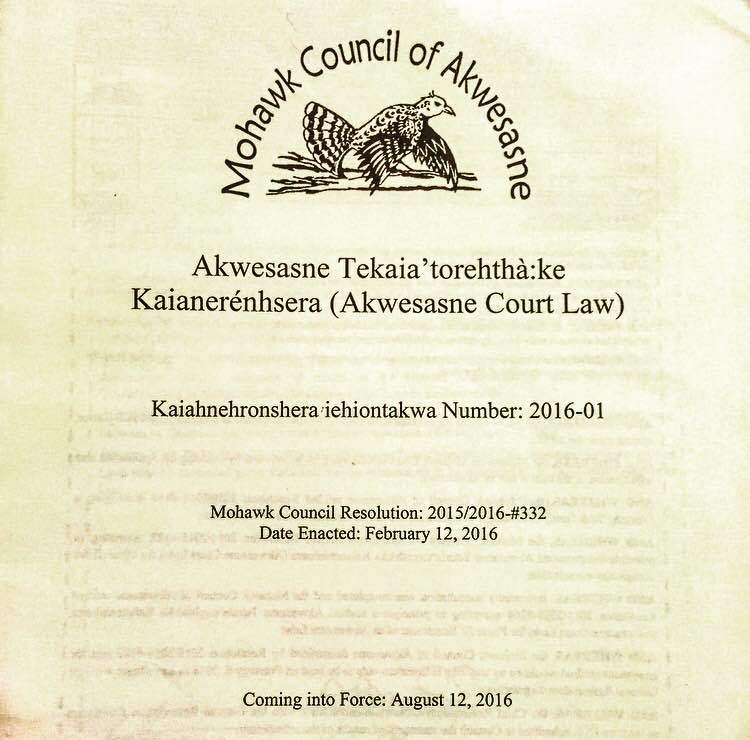 Akwesasne Tekaia’torehthà:ke Kaianerénhsera (Akwesasne Court Law), MCR 332 2016, Preamble para. 10. Ibid at Purpose para 2. “Akwesasronon” is the Mohawk term for community members of Akwesasne. While other First Nations have established courts (see the Nisga’a Treaty), the Akwesasne Mohawk Court is the first institution of its kind established under the inherent Aboriginal right to self-government, recognized and affirmed by section 35 of the Constitution Act, 1982. For example, section 7 of the law helps to ensure the principle of judicial independence is upheld by holding the Akwesasne ratiianerenhserakweniénhstha (justices) and teshatiia’toréhtha (appeal justices) accountable to the Akwesasne Review Commission for their conduct. The Akwesasne Review Commission can also be called upon to rule on an alleged conflicts of interest of justices or appeal justices. Published by ameliaphilpott on August 25, 2016 at 9:50 pm under Breaking news, In the field. 0 comments. Over the course of my internship at the Centre for Health, Human Rights and Development (CEHURD) in Kampala, I’ve witnessed some challenges with some of the cases and petitions we brought forward to the courts. In particular, one difficulty was caused by the influx of election petitions triggered by the recent Ugandan general election, which was held on February 18, 2016. This was the 6th general election since the Uganda Bush War (1979-1986) where the National Resistance Army, led by current president Yoweri Museveni, overthrew the autocratic and militaristic regime. February’s election saw Museveni’s controversial re-election ­–his sixth consecutive term as the President of Uganda. The election results sparked protest, arrests and a series of formal election petitions. 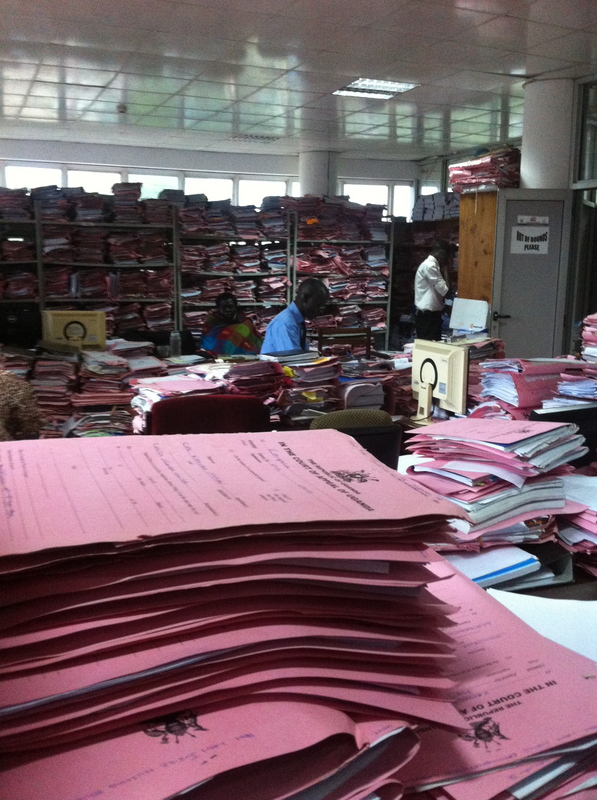 These election petitions have put much strain on the Ugandan judicial system, which has resulted in an even longer wait before Ugandans and Ugandan organizations can access justice before the court. Last week, Justice David Batema came to speak to the CEHURD’s staff about his experience working as a judge at the High Court of Uganda. He spoke about the courts’ challenge to process cases in a timely manner, especially during the post-election period. When I asked him how the High Court prepares for the flood of election petitions, Justice Batema explained that the High Court developed a new strategy to minimize backlog. The High Court’s new strategy consisted of selecting 26 judges (almost two thirds of the High Court Judges in Uganda) and training them on best practices when dealing with the petitions. To ensure nonpartisan decisions, the judges would then be relocated to a different district where they’d hear the petitions. This process, Batema explained, is designed to address all the submitted election petitions ­–hearing, trial, and judgement– within 60 days. This ambitious plan, however, is expected to exceed that timeframe. Further, if petitions are appealed, the process will take even longer. Despite the Court’s effort to limit the backlog of cases, law firms, organizations such as CEHURD, and all the others parties involved are left with even more delays in their attempts to access justice. Furthermore, Justice Batema has been vocal about the Courts being short-staffed: “we have very many cases, but we are few, we don’t want our people’s cases to delay here,” he said to one of the national newspapers, New Vision. As CEHURD continues to fight for health and human rights in Uganda, this unfortunate influx of election petitions has created an additional hurdle in bringing forward cases and seeing them resolved. Published by andremoreau on July 19, 2016 at 9:48 am under Uncategorized. 0 comments. This is my fourth week in Kenya for my internship with the Equality Effect. I am working in Meru, with a student from the University of Toronto. We have been placed with a partner organization, who does almost everything. It has an orphanage, a health clinic, it provides micro-loans, there’s a school, and most importantly, a rescue centre. The rescue centre currently houses about 25 children, most of whom have been defiled (sexual assault of a minor). They offer them counselling, legal support, medical support, and aid during the transition into motherhood for the girls who become pregnant. Only those girls who either have nowhere to go or are in danger within the community are admitted, others are treated at home. Our job is to comb through the files since the 160 Girls decision was made last year to document how police treatment has changed, if at all. The decision clearly stated that the police must diligently fulfil their obligations to all children who bring a complaint of defilement to them. The belief is that, as Meru was ground zero for 160 Girls, the police here are the most likely to be compliant (the decision was binding across the country). The most interesting part of our job is going to court. We’ve so far seen been to two trials… sort of. The Kenyan legal system is slow and delays happen regularly, mostly for reasons that would not fly in Canada. Our first court date was at the courthouse in the city. Most of the Courthouse is outdoors, while the courtrooms are indoors. We checked a typed list posted on a notice board to see in what order our case would come. It was supposed to be a mention for an elderly man who had allegedly defiled a girl of 14. (I’m still not entirely certain what a mention is, but in this case, it meant the accused had a chance to accept or deny the evidence placed against him). We waited outdoors, on three long benches under a corrugated roof, for the accused’s name to be called. We sat at one end of the bench with the social worker and the mother of the victim. At the other end of the bench, probably no more than 20 metres away, awaited the accused who was out on bail. While I am not so familiar with Canadian courthouses, I was upset by the casual nearness the accused and the victim were expected to endure. Particularly in such a sensitive case. Eventually, the accused’s name was called and we followed him into a magistrate’s chambers. The Courts are undergoing a transition, and the magistrates are currently hearing cases in their chambers. The room was barely big enough for the magistrate’s large desk, a desk for a bailiff/secretary, a bench crowded with the accused and his lawyer, and us four standing partially out in the hallway. Kenyans are very soft-spoken people, so I unfortunately did not hear anything. But we were in out and out of that room within a few minutes. Apparently, a new magistrate was assigned to the case. When this happens, the accused is asked if he wished to re-start the trial or continue. I am unsure what the accused chose, but I believe he did choose to continue. The mention never came though, because the case notes were not typed. The magistrate then adjourned for another month or so, even though the case has been on-going for over a year already. This sort of delay is a frequent occurrence. Another, even more frequent type of delay, is the absence of witnesses at trial. The second day we spent at a different courthouse. Once again, we checked for our accused’s name on a bulletin board and saw that it would take place in Courtroom 1. We waited for the courtroom to open (about an hour later than it was supposed to) and entered. We, and many others, squeezed into a tiny courtroom on three very uncomfortable wooden benches. A female magistrate eventually walked in. They called one accused at a time to begin their mention or hearing. While it took place in Kiswahili, it was easy to understand that many witnesses and some accused were missing. It was finally our accused’s turn. He was accused of defiling his tutee, his defence was that he thought she was over 18. He stood up. Some questions were asked in Kiswahili. One name was called. Silence. Another name called. More silence. Neither the doctor nor the police appeared to testify. Case adjourned for another month. Published by annieodell on June 18, 2014 at 2:43 am under In the field. 0 comments.